September may have come and gone, but the reality of another school year barely begun is front and center on the mind of this busy NGP writer and one must assume, many other gaming students out there. 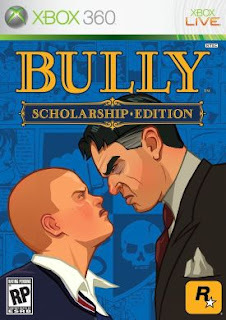 In the spirit of continued education, might I humbly suggest Bully: Scholarship Edition for Xbox 360 as a game you probably overlooked the first (or even second) time? Originally a 2006 PS2 release, Bully didn't show up on my radar until the 360 vesrsion was released this past March. The original launch was overshadowed by negative press generated by parental groups concerned that the game was essentially Bully Simulator 2000. Once again proving that most backlashes are based more on reactionary sentiment rather than fact, anyone who actually played the game for 10 minutes would see the it actually carries a strong anti-bullying message. That's really neither here nor there though. What matters is the product that Rockstar delivered is at least as good as their more established franchise, Grand Theft Auto. Gamers who have spent time in Liberty City or San Andreas will find Bully familiar territory. You're basically looking at a series of missions interspersed with humourous cutscenes and free-roaming gameplay. It's a formula that has been in place since GTA3, but it works. Bully isn't set apart by reinventing gameplay types, it's rather the underlying social commentary that makes this game stand out. The GTA series has tried to do this in nearly every iteration, but in my mind the attempts at satire have always been a little too overt. The kid who is going to hopefully be proving all these claims to you is 15 year old Jimmy Hopkins. Jimmy's your typical young adolescent male, but he's also remarkably perceptive for his age. When the intro movie rolls and we see young James being dropped off at Bullworth Academy for the first time, we quickly see that this kid isn't a comic exaggeration of an old character archetype. He's not war-weary Niko Bellic or a big time mobster Tommy Vercetti. Jimmy is the kid you probably went to school with who didn't want to be there and wasn't shy about making that fact known. He's tough, but not so much that he won't let a "wheeee!" loose when you go flying off a ramp with your BMX. Maybe you were Jimmy yourself in school, and the only thing that got you through those years was your own mental or physical toughness. Either way, Jimmy is very relatable, and that is only going to make him a more sympathetic character to the player. You really start to feel like the system has failed Jimmy and countless others like him, which is really the criticism put forth in this game. The rich and strong kids thrive at Bullworth, while the intellectuals live in fear of beatings and embarrassment. Jimmy quickly sees this and sets about trying to right the perceived injustices of the school. It's a theme that has been done before, but is the game simply about a kid trying to make things better at his school, or is it a larger commentary on the American educational system as a whole? Bullworth is a school with a staff full of corruption, alcoholics and biology teachers who seem to enjoy dissections a little too much, and yet Jimmy is quickly targeted as a sort of cancer by the administration. This is where I feel Rockstar really nailed the frustrations of youth. Jimmy may not be an angel, but his motives are ultimately good. Given his age and position in life, the odds of him succeeding are poor, and those who are supposed to be helping him towards becoming a productive member of society are so incredibly flawed that he can't help but question the institution he's a part of. The game isn't perfect by a long shot though. Jimmy's romantic interactions with the ladies (or gents if you choose the rainbow path) seem to be more monetary transaction than affectionate responses to one another. My girlfriend happened to see one of the smooches Jimmy planted on one of his many lady friends and remarked that the kissing was "really unrealistic". Oddly enough, she didn't question Jimmy's ability to obtain said smooches simply by presenting handful after handful of freshly stolen flowers from the local girls dorm. Do games often make you think of a greater issue outside of them? Should they even try to do so? Maybe they should just be inclusive experiences where we shut our brains off for an hour or two and forget our troubles. But if games stay that basic, if we don't allow them to evolve into something beyond simple entertainment, then our medium will stagnate. Many people mark their lives with songs or movies that had a profound effect on their way of thinking, why not games? Bully got swept up in controversy that it didn't seek, and the gem of a story got lost in the storm. Is it one of my favourite games of all time? Not a chance, but I'm hugely encouraged by what Rockstar tried here. I can only hope that they continue to think outside their GTA universe and refine their satirical storytelling that I've come to expect from them.